When I looked at the first arc of the 2012 anime Jojo's Bizarre Adventure earlier this year, I said that it captured the essence of the manga for better and worse. The second arc suffers from the same double-edged sword; but thanks to a far more interesting story and protagonist, it comes off much more enjoyable than the first. The Jojo of the first arc, Jonathan Joestar, was a bit of a bore. He was a cultured gentleman who was always pure and doing the right thing for the right reasons. He also wasn't very intelligent—especially compared to his nemesis Dio. 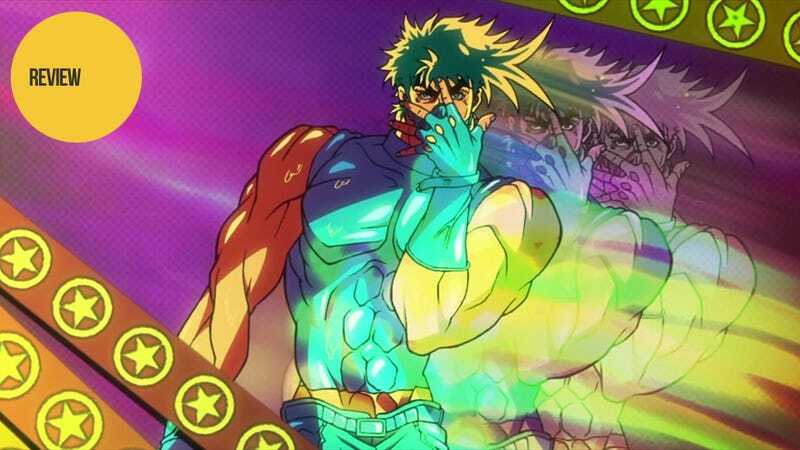 Joseph Joestar, on the other hand, while not book smart, is incredibly street smart and can easily predict the strategies of his opponents and prepare accordingly. And this is half the fun of the series, watching Jojo end up in the worst situation possible, only to find out he has already won through trickery no one noticed. Also, nothing is quite as awesome as surprising a vampire with a Tommy gun and several hand grenades. The first story arc, which centered around fighting vampires and zombies in Victorian England, is not exactly what I would call a “bizarre adventure.” Instead, it felt more like a martial arts movie mixed with a Gothic horror tale. But things like fighting an ancient Aztec god-man to the death in a vampire horse-pulled chariot race in the Swiss Alps as we see in the second arc definitely live up to the title. The second arc is also much more of a world-spanning adventure, which visits everywhere from New York to Mexico to Italy. This gives the whole story much higher and wider-reaching stakes. While set up as the bad guys at the start, the Nazis—because if you need an army investigating something mystical, who else would you turn to?—are revealed to be somewhere between an ally and a pseudo-joke soon thereafter. Sure, they constantly rant about the superiority of German technology and culture during each and every appearance, but time after time they appear at just the right moment to help Jojo and his friends achieve victory. But Nazis being good guys in the story—even if they are good guys simply by the necessity of teaming up to face down a greater foe—is pretty much the opposite of everything I have been trained to think of as a gamer (and as an American, for that matter). And it is oddly disconcerting seeing them continue to be true and honorable allies throughout the whole affair and never once betraying Jojo (who is British) and his friends. Portraying the Nazis this way isn't bad per se from a narrative perspective, but it certainly does mess with your expectations. And as for the whole moral aspect of Nazis being good guys, well, that could easily be a deal breaker for many prospective watchers. Bad – Would You Please Stop Talking About Punching the Guy And Punch Him Already? The exposition in the second arc of Jojo's Bizzare Adventure is downright painful. The first arc was also particularly bad in this aspect. Speedwagon and/or anyone else not directly taking part in the fight would give an endless running commentary. Sometimes a good thirty seconds of dialogue would happen in between a single punch and the next. The second arc kicks it up a notch by constantly having the narrator add his two cents to that of the peanut gallery. Worse yet, this exposition is also present in the dramatic moments as well. It actually makes everything less emotional when the narrator is telling me how sad it is instead of just letting me get caught up in the story and feel for myself how sad it is. Anime is a visual medium, we are seeing what is happening—we don't need to be told what we are seeing. But overall, the second arc of Jojo's Bizarre Adventure is a lot of fun. While the villains never quite live up to the over-the-top evil of Dio, the second Jojo is a far more enjoyable protagonist than the first. On top of that, the anime is beautifully drawn and well-acted. And as for the problems that plague the beginning of Jojo's Bizzare Adventure, I feel they are a product of the time it was written—nearly 30 years ago. There have been so many improvements in narrative storytelling in the years since that what seemed exciting and tension building in the eighties now seems campy and ponderously slow. If you are in need of a truly over-the-top “bizarre adventure” or if want to see an 80s anime with a 10s coat of paint, be sure to give Jojo's Bizzare Adventure a try. Jojo's Bizarre Adventure aired in Japan on Tokyo MX. It has not been licensed for a Western release. However, for those interested in importing, the Japanese Blu-rays come complete with English subtitles.